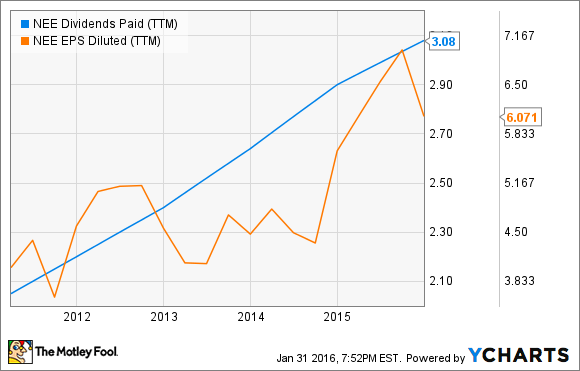 Will NextEra Energy Raise Its Dividend in 2016? This is one utility that may still have room for dividend growth. At a time when many utilities around the country are experiencing slowing demand growth and pressure from new energy sources, NextEra Energy (NYSE:NE) has managed to continue on its growth trajectory. That's in part because of growth in its main market of Florida, but it's also because the company has made some key strategic moves to adapt to the new environment. One of the ways shareholders can benefit from NextEra Energy's success is through a growing dividend. Are we in for another increased payout in 2016? The key to growth in the utility business is expanding customer demand from customers. And NextEra Energy has both a growing customer base and growing demand from those customers. In the fourth quarter, customer growth and mix grew 1.4% and underlying usage grew 0.7%. Combine that with warmer than warmer than usual weather and retail electricity sales grew 11.7% in the fourth quarter and 5.6% for all of 2015. Florida seems to be benefiting more than most states from the improving economy and a growing population. That plays right into NextEra Energy's hands. One of the factors disrupting most utilities in the U.S. is renewable energy. Wind and solar are helping make coal plants obsolete, taking peak demand away from wholesale energy producers, and allowing customers to produce their own energy. One way for utilities to adapt to this reality is by building their own renewable energy plants, which NextEra Energy is doing rapidly. You can see below that the company is even exceeding its own plans with 4.0 GW of renewable plants signed and in operation. The other move the company is making is acquiring Hawaiian Electric Industries (NYSE:HE), a utility that could be a test field for the utility of the future. Hawaii has more rooftop solar than any other state and the utility will have to adapt, just as it eventually will in Florida. If the acquisition is completed, it could provide growth and a lot of learning for the utility. Recently reported 2015 results showed a $0.41 per share increase in adjusted earnings per share to $5.71 per share. In 2016 management expects 2016 earnings to grow to $5.85-$6.35 per share and 2018 to expand to $6.60-$7.10 per share. That bodes well for a dividend that's currently being paid at an annual rate of $3.08 per share. Given the growth in core electricity usage, investments in new renewable energy, and the low payout ration I think investors can expect another dividend increase in 2016. NextEra Energy is one utility handling the changes in energy well and that will bode well for investors.